Princess Cara lost another tooth today. That sucker was hanging by a "thread" for days but she refused to let us get it out. Today, she had a grilled cheese for lunch and it came out. There was much fan fare and hoopla at the school as we had to go to the school nurse who had these little plastic treasure chests to put the tooth in so we could safely bring said tooth home. Of course, Princess Cara came home squealing with excitement..."Mom! Call the ToothFairy!!" Followed by incessant questions..."Did you call? Is she coming? When will she come?" Sigh. I can't believe I am still at this kid game. With the announcement of the 2010 Official Tooth Fairy Poll ® , the “Tooth Fairy Index (TFI)” is showing that the value of a lost tooth is closely related to the U.S. economy. Much like the Punxsutawney Phil’s Groundhog Day weather prognostication, the Tooth Fairy Index is an indicator of the direction of the economy. Through the past decade, the Tooth Fairy Index has closely resembled the Dow Jones Industrial Average’s yearly trends. The graph below shows the historical look at more than ten years of history. GTFOOH! Now I know. Now we all can know. The National Average is $2.16/tooth. Thus, we have decided that since the cost of living is higher here in the DMV we would round up to an even $3. And since Princess Cara is a spoiled little Diva with GMa's running amok...she gets double. The Queen Mother has spoken and she added to the loot. 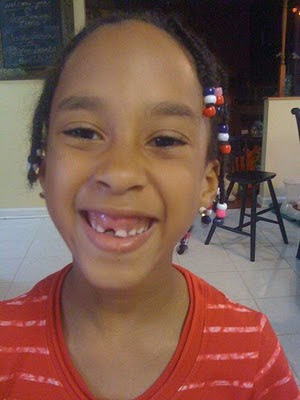 She has a total of $6 now for that single tooth. Jeeze Louise. 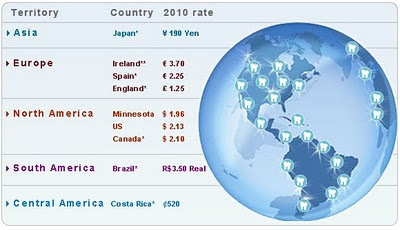 And just in case you wanted to know about Global Tooth Fairy Giving around the globe. Check out the chart below. The internet is a beast when inquiring minds want to know. So, what is your The Tooth Fairy's going rate for a tooth around your way.